Alma has everything she needs, except answers to her questions. Her mother won’t tell her why her beloved stepfather, Adam, is suddenly gone this summer. Or about life in Portugal, where her parents met. Not even about her father, who Alma cannot find, no matter how many graveyards she searches with her best friend, Julia.Then Alma’s mother shocks her by moving them both to Lisbon so Alma can fall in love with the vibrant city where her father grew up. There she discovers she has more family than she could have imagined.She hopes Portugal holds the answers she’s been desperately searching for, but it turns out finding the truth may be more complicated than she, or her mother, bargained for. I don't really know what to say about this book. I just genuinely didn't like it. The only thing that I enjoyed about this book was the best friend. The best friends was so nice to read about, she brought to interesting conflicts to the story without it being too contrived. Besides her the mother was despicable, the daughter was irritating and selfish, all the other characters we bland. They sometimes said things and all I could think was "you can't be this dumb". I started to enjoy it near the I don't really know what to say about this book. I just genuinely didn't like it. The only thing that I enjoyed about this book was the best friend. The best friends was so nice to read about, she brought to interesting conflicts to the story without it being too contrived. Besides her the mother was despicable, the daughter was irritating and selfish, all the other characters we bland. They sometimes said things and all I could think was "you can't be this dumb". I started to enjoy it near the end, but I don't know if that was because it got better or because I could see that there weren't that many pages left. The one saving grace in this book was the best friend and I wish there was more of her in it. E ARC from Edelweiss PlusAlma has been raised by her single mother since the death of her Portuguese father when she was young. Her mother had attended college in Lisbon, where the two met, and has steadfastly refused to answer any questions about Alma's father. She won't even say where he is buried, which has led to an obsession with finding this out. Alma's best friend Julia always sticks by her. Recently, the mother has split from Adam, her husband, who was very fond of Alma but will not tell E ARC from Edelweiss PlusAlma has been raised by her single mother since the death of her Portuguese father when she was young. Her mother had attended college in Lisbon, where the two met, and has steadfastly refused to answer any questions about Alma's father. She won't even say where he is buried, which has led to an obsession with finding this out. Alma's best friend Julia always sticks by her. Recently, the mother has split from Adam, her husband, who was very fond of Alma but will not tell her why he is no longer living with them. Since Julia is Adam's niece, Alma manages to get a little information. Alma's mother is not doing well, working from home a lot, dropping Alma off at Julia's, and selling the furniture piece by piece. When Alma is not registered for the school bus on the first day of school, her mother finally tells her that they are moving to Portugal to meet her grandmother. Alma is a bit scared, but also glad that her questions might finally be answered, since she often "talks" to the idea of her father. When the two get to Portugal, Alma gets to meet a cousin, go to school, and checks the cemeteries to no avail. Perhaps the reason she can't find a grave for her father is because he is still alive.Strengths: Like this author's Forever, or a Long, Long Time , the writing is strong. Alma is a self-sufficient character who is raising herself in the face of very bad parenting. It's good that she has a support network in her mother's parents and in Adam, who won't answer questions but reassures her that she is loved and that he will be there if there is a problem. The brief glimpses of life in Portugal are fascinating. Weaknesses: I have a lot of students whose fathers are not in the picture, and Alma's obsession with her father seems a bit odd. The treatment of the mother by her parents and the shame over Alma's birth seemed very odd-- she would have been born in about 2006. I wish more had been addressed about the mother's mental health-- clearly, something is very wrong, and Alma needs even more support. No one gives Alma answers, even when it leads to defiant behavior. What I really think: Not sure about this one. Debating. 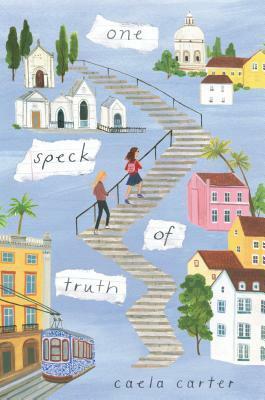 Reading One Speck of Truth was like climbing the old, narrow stairs in Lisbon; Caela Carter offered glimpses of beauty along the climb, but obscured the full truth until the end. Like Alma, I missed seeing some of the truth that should have been visible and thought I knew what had only been implied. Alma was a compelling character with a strong motivation and the fault of short-sightedness (and not the kind that could be fixed by her big green glasses). Only later in the story did I recognize ho Reading One Speck of Truth was like climbing the old, narrow stairs in Lisbon; Caela Carter offered glimpses of beauty along the climb, but obscured the full truth until the end. Like Alma, I missed seeing some of the truth that should have been visible and thought I knew what had only been implied. Alma was a compelling character with a strong motivation and the fault of short-sightedness (and not the kind that could be fixed by her big green glasses). Only later in the story did I recognize how Julia is not only a friend, but an important foil for Alma. Through the secrecy and mistrust Carter makes the case that every child deserves a family, and also that sometimes that family is one we least expect. This will be a good book for readers who enjoy a bit of mystery or whose hearts are feeling a little crumpled and alone. This book was filled with questions and the answers were too few or too late. Alma was a sympathetic character and I found her understandable. Her mother Mercy was off the charts unbelievable. How could you not tell a 12-year-old she is switching schools and moving out of the country before the first day of school, especially when you are farming her out to the home of her best friend most of the summer. Don't even get me started on the American grandparents. The only adult characters I liked we This book was filled with questions and the answers were too few or too late. Alma was a sympathetic character and I found her understandable. Her mother Mercy was off the charts unbelievable. How could you not tell a 12-year-old she is switching schools and moving out of the country before the first day of school, especially when you are farming her out to the home of her best friend most of the summer. Don't even get me started on the American grandparents. The only adult characters I liked were Adam and the Portugese grandmother. Alma does manage to learn a thing or two, but it's a wonder. I did like the ending.Thank you to HarperCollins and Edelweiss for a digital ARC of this book. I appreciated the real, flawed characters in this story. For me, it was a page-turning, tear-jerking thriller, and my heart connected with Alma as she obsessed over finding her dad. Lots of complex relationships and bumpy self-discovery that resolve in a middle grade-appropriate way when Alma learns that being vulnerable with the people you love is the way to create true familial bonds.The only downside was I felt like the Mom’s behavior in Pittsburgh flirted with mental illness in a way that wa I appreciated the real, flawed characters in this story. For me, it was a page-turning, tear-jerking thriller, and my heart connected with Alma as she obsessed over finding her dad. Lots of complex relationships and bumpy self-discovery that resolve in a middle grade-appropriate way when Alma learns that being vulnerable with the people you love is the way to create true familial bonds.The only downside was I felt like the Mom’s behavior in Pittsburgh flirted with mental illness in a way that was never addressed. And I’m hoping for a sequel about Julia’s search for her birth mom! Twelve year old Alma's life has been consumed by questions - primarily about her apparently deceased father. Alma's mother and grandparents excel at prevarication and never answer her questions. Both Alma and her mother grow up a bit in this coming-of-age story about discovering family, practicing and trusting good communication, and aligning reality with expectations. I was given an advanced copy from Edelweiss for my honest review, here it is. The fact that there was not one single adult who would stand up to her mother for this poor girl's sake really made me angry. Liked the setting in Lisbon, Portugal but the characters were annoyingly unrealistic in both their treatment of others & their acceptance of the treatment by others. An unsettling story of family, disruption, and the insatiable need to answer questions, even if the search and knowledge come at a great expense. Alma's mother is controlling, to say the least, and not at all forthcoming with information about Alma's father. Alma's only friend, Julia, joins Alma's on furtive missions to local cemeteries in the hopes of finding Alma's dad. Alma buries scraps of paper with questions, hoping one day the answers will be revealed. Alma's stepfather effectively vanish An unsettling story of family, disruption, and the insatiable need to answer questions, even if the search and knowledge come at a great expense. Alma's mother is controlling, to say the least, and not at all forthcoming with information about Alma's father. Alma's only friend, Julia, joins Alma's on furtive missions to local cemeteries in the hopes of finding Alma's dad. Alma buries scraps of paper with questions, hoping one day the answers will be revealed. Alma's stepfather effectively vanishes from her life, a sudden loss that leaves Alma with even more questions. When Alma's mother suddenly uproots the two of them for Portugal, Alma finds more than she'd ever expected about her family. I'm willing to roll with a truly unlikable character, and I count on Carter's writing to embrace the darker sides of characters' pathologies, but Alma's mother read as both horrifically unlikable AND mentally ill for much of the book, with no reconciliation for a young reader. I appreciated Julia's own search, and her family dynamic, as a means of contextualizing Alma's quest. And I learned a lot about Portuguese architecture and snacks! Ultimately, though, the book was unsettling and not in a good way. Not my favorite of Carter's work.